Solar Control Window Film saves energy. A lot of energy. But that’s just scratching the surface of this amazing product. Like the proverbial “renaissance man,” window film does so many things well that it is truly mind-boggling. Sure it saves energy by reducing heat intrusion. But in the process, it also enhances comfort, relieves annoying glare, reduces fading of valuable furnishings, carpeting and window treatments, makes glass safer – the list goes on and on! But let’s concentrate on energy savings. One of the primary sources of “energy overload” in any building – home or office – is the heat coming through windows. Air conditioning systems work full time to cool home and office spaces so occupants can be comfortable and productive – and that costs money. Quality window films such as SolarGard® or Panorama® can reduce the sun’s heat by up to 82%! 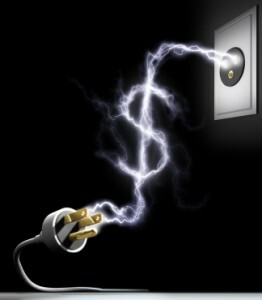 They can help your home or business consume up to 30% less energy by keeping interior temperatures more stable. Films are less costly than installing new windows, and more efficient than low-e coatings at rejecting heat. Lawrence Berkeley National Laboratory, University of California found that window film tops the “Return On Investment” list when compared with window replacements, blinds, awnings, shade trees and reflective roofs. In your business, film not only saves on energy expense; it can help your building achieve points toward LEED certification in six different catagories! 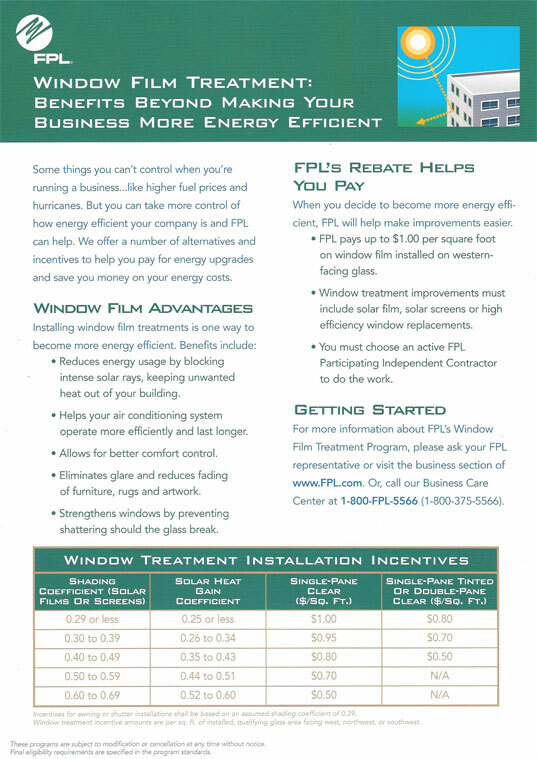 Additionally, window film qualifies for immediate cash incentives from Florida Power and Light; providing significant “up front” savings and making the installed cost even more attractive. Now think “green.” SolarGard® and Panorama® Window Films are the only film brands certified to be “carbon-negative!” Over their expected useful life SolarGard® and Panorama® will save 1001 times more greenhouse gas emissions from entering the atmosphere than are used or created during their manufacture! The carbon cost of one square meter of SolarGard® or Panorama® sun control film is less than 1 kilogram. By comparison, a low-e wood frame window has a carbon cost of approximately 253 kilograms per square meter! Those are some pretty impressive “side effects” from saving energy with one affordable, attractive, and obviously effective product. Energy savings, comfort, UV protection, glass safety, and helping to save the environment. Invest a few minutes out of your “Energy Awareness Month” to find out more about these incredible high quality products from Solar-X of Sarasota. We’ve been helping home and business owners save energy – and the environment – since 1973!